We see each other for the final time this morning. Heather, Caroline, Ronan and I sit and have breakfast, this time joined by Kevin, aka Spiderman, my trusty bag carrier all week. He wanted to come and see us, and he hasn’t seen a breakfast of cornflakes, orange juice and scrambled eggs on toast before, but certainly seemed to enjoy it all! Kevin is actually from Dar Es Salaam, about nine hours away by bus, and is here to earn a little money in a break from his studies. He has done the mountain four times, and tells me that he has had enough. It is too hard. I don’t blame him. Not only is he about a foot shorter than me, but must also be a good fifty pounds lighter (or make that eighty:)), and he has to carry bags the likes of mine (20kg or so) on his head all day up that mountain for $50 a week. I couldn’t carry my bag up there for a million dollars, just couldn’t do it. He has my utmost respect. He also tells me that the mountain scares him – he has already seen and heard of people dying up there. Now that is really not funny at all. We all enjoyed seeing him today though, and we swap email addresses and say we will keep in touch – I also gave him another little ‘bonus’ for being a great guy and also a good friend up there. At 9am after Kevin leaves, Ronan and I say goodbye to Caroline and Heather. They are off on safari to the Serengeti, the Ngorogoro crater, and lots of other exotic places on a six day trip. I wish I was going with them, as I would dearly love to go to those places, and also because I shall miss them both – we spent a week on that mountain together and you cannot help but bond. We also kept together, the three of us, pretty much the entire way, and so we walked and shared the whole of Kilimanjaro together – that is a pretty special thing to have, certainly for me. I will look forward to hearing subsequent tales of their adventures and hope we can keep in touch. So to Caroline and Heather, if you are reading this – I miss you bunches, and hope you had a great time on safari and in Zanzibar, and also a good trip back to the States. 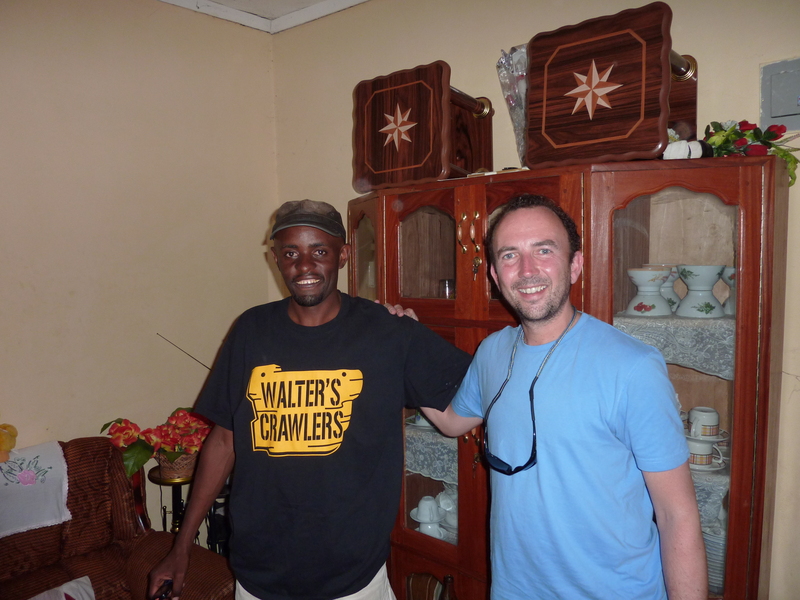 His furniture and crockery and cabinets were not at all what I had expected, it was really quite amazing. He told Ronan and I that he plans to ‘find a wife’ and get married next year. I wish him so well – a nicer guy you could not meet. 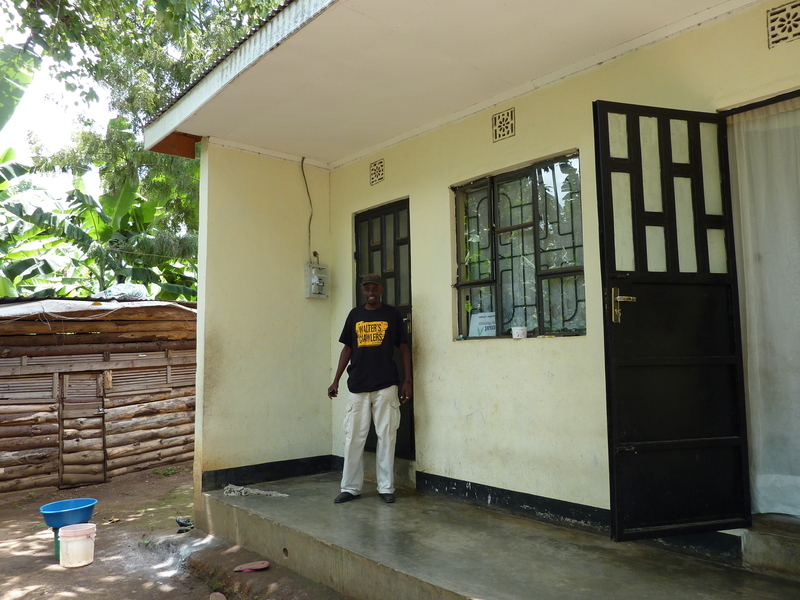 He then took us on to look at his parent’s house, in the garden of which he is also building another house for himself. 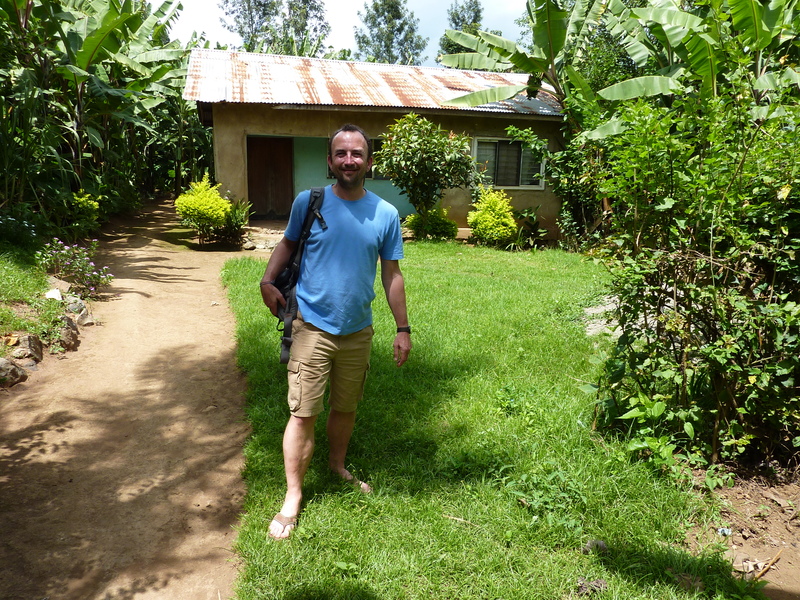 His parents have banana trees and some goats and not much else, but it was in a great secluded spot, and I loved getting the opportunity to see it – thank you so much Raymond. 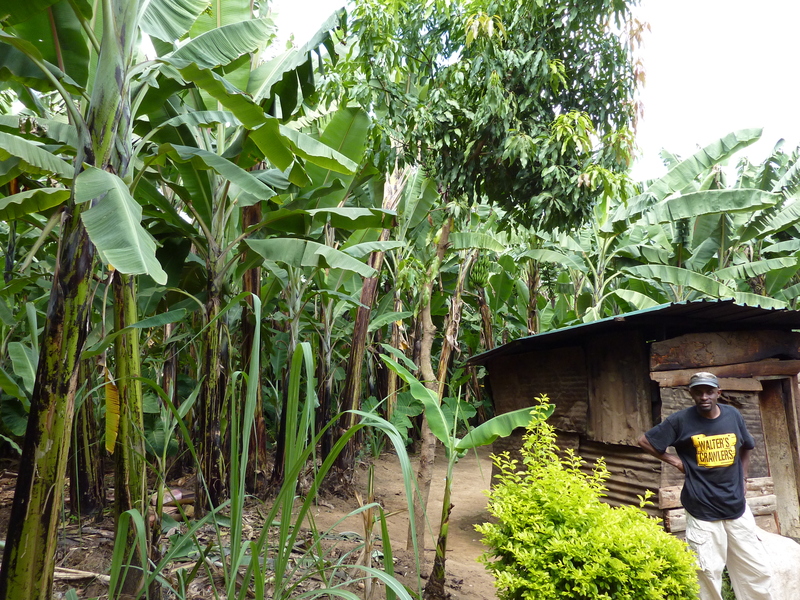 Raymond's parents' kitchen, and their banana trees. On the way there on a very rough road we went past what used to be Raymond’s school and also his local church. The place is probably a mile away from the main road, and I do not believe that (and Raymond confirmed this) that the children at the school had ever seen a white person before. 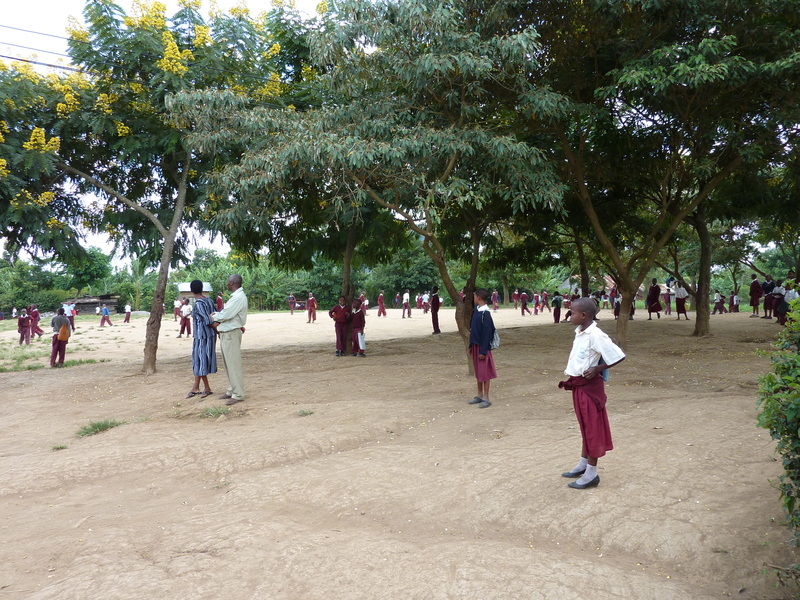 The children excitedly swarmed around the car yelling “Mzungu” (meaning”white man” in Swahili) at Ronan and I. Had the kids been older than nine or so I actually might have been slightly initimidated there were so many of them, but instead it was totally charming in every way. At Raymond's school. The local pastor and also his former schoolteacher are in the left of the shot too. 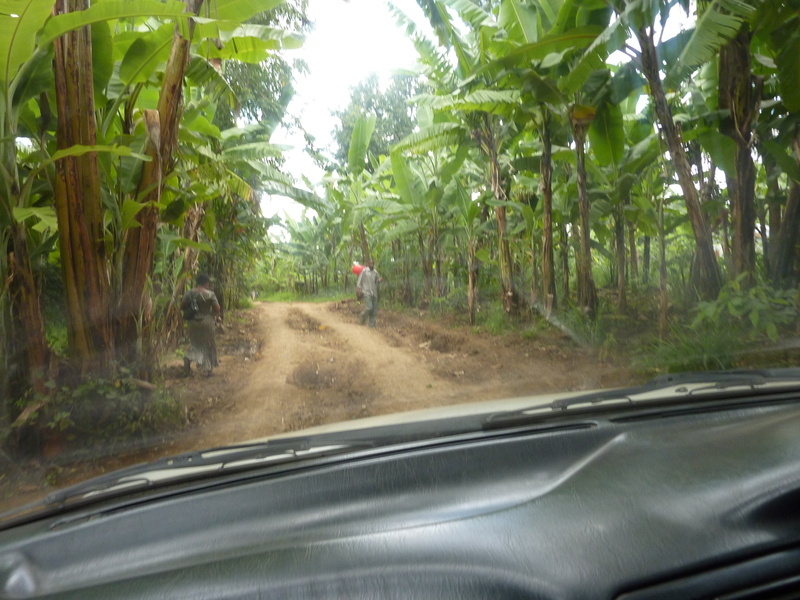 The second is on the road back to Arusha town from the house. It was an experience just to be on this road, and made me stare wide-eyed at the surroundings, which were just amazing. From here we got back to the hotel in good time for a beer and some food. It was a very hot day, and I bade farewell to Ronan for the last time. My taxi to the airport came at about 5pm and I was on my way out of Africa. I was very much wiser, extremely happy, and so grateful for all that my trip had brought to me. I could harp on about the trip back via a very hot, oppressive and unpleasant Nairobi Airport, but the story is irrelevant in the overall scheme of things. It passed, it was just something that had to be done to get me back to whatever ‘normal’ life was. I did however win a few games of ‘Oh Hell” over a few bottles of Tusker beer in the airport. For the record, I landed back in the UK at Heathrow at 5.45am on Thursday 4th March 2010, just eleven days after leaving. Those eleven days changed my life forever – they couldn’t not do so, as much as anything because I wanted them to. There is a book which is a favourite of mine called “Illusions” by Richard Bach, and one of my two favourite quotes from the book is ….” Every person, all the events of your life, are there because you have drawn them there. What you choose to do with them is up to you.” I had chosen Kilimanjaro, or perhaps it chose me, one of the two. Either way, I had a choice what to with it, and still do now. I am very happy that I have that choice, and enormously lucky that I had the good fortune, good health, and support, to be able to climb Kilimanjaro. I give thanks therefore to those few, those happy few, who I got to share this all with. And I get just as big a buzz, or maybe even an even bigger one, from those people who choose to put comments onto this blog. If I have helped just one person in a tiny way to get themselves up that mountain, or to realise some other ambition, then I am an even happier soul. But conclusions to be drawn from this are for next time – my job here is nearly done……………..